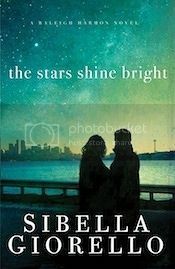 Today I get to write a review of yet another fantastic book in the Raleigh Harmon series by Sibella Giorello. This one is book five... The Stars Shine Bright, and just like I said in my review of The Mountains Bow Down, this is the best one yet. I was introduced to Raleigh Harmon, a forensic geologist, in The Clouds Roll Away which is the third book in this series. I reviewed that here, and went in search of books one and two as soon as I realized they existed. While I think this series is absolutely fabulous, I would not recommend starting with this book. I do think this would be a good book on its own, but there is so much in the back story and I just think it a new reader would miss too much. Sent undercover to a thoroughbred horse track, Raleigh takes on a double life to find out who’s fixing the races. But when horses start dying and then her own life is threatened, Raleigh realizes something bigger—and more sinister—is ruining Emerald Meadows. She’s never felt more alone. Her one contact with the FBI is Special Agent Jack Stephanson, a guy who seems to jump from antagonistic to genuine friend depending on the time of day. And she can’t turn to her family for support. They’re off-limits while she’s undercover, and her mother isn’t speaking to her anyway, having been confined to a mental hospital following a psychotic breakdown. Adding insult to her isolation, Raleigh’s fiancé wants them to begin their life together—now—precisely when she’s been ordered not to be herself. With just days left before the season ends, Raleigh races to stop the killing and find out who’s behind the track’s trouble, all the while trying to determine if Jack is friend or foe, and whether marrying her fiancé will make things better—or worse. Raleigh is walking through the darkest night she’s faced, searching for a place where the stars shine bright. I don't even know where to begin in talking about this book. The writing is so descriptive and the characters are well-rounded and just feel so real. I love their complexity -- everyone is flawed, most have redeeming qualities, and many can be quite humorous as well. Giorello writes so well... I felt anxious as Raleigh was facing some decisions or traumatic situations, and the next moment I'd be laughing out loud. The tension and action-packed nature of the plot kept me turning pages until my Kindle died, and then had me up and reading again first thing in the morning. This is Christian fiction, but it isn't preachy Christian fiction. That's really important to me. It also has some romance aspects, but it is far from the focus of the story. That's also important to me. I've talked in the last two reviews about how realistic this all feels. It is clear that Giorello knows her geology and she clearly isn't afraid to talk to experts in order to bring authentic-feeling detail to the plot and characters. Hey:) I reviewed this book as well. I started the series here--never read anything by her before.